Israeli forces, today, prevented Palestinians from farming their lands in Jaloud village, to the south of Nablus, in the north of the West Bank, said a local official. 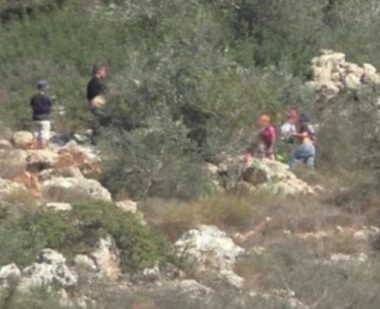 Ghassan Daghlas, an official who monitors settlement activities in the northern West Bank, said that Israeli soldiers prevented farmers of Jaloud from cultivating their own lands, located within Area B, which is administered by the Palestinian Authority but under Israeli military security, and adjacent to the illegal Ahiya settlement outpost. He added, according to WAFA, that Israeli troops have repeatedly prevented Jaloud farmers from accessing this tract of farmland, which occupies tens of dunams. Israeli forces and settlers from the settlement outposts of Yesh Kodesh and Ahiya, near the Adi Ad settlement, have regularly attacked Palestinians from nearby villages, including Jaloud, targeting their farmlands. The attacks are intended to make life difficult for Palestinian villagers, to force them to leave and allow settlers to expand their settlements.